This month's sourdough challenge at Sourdough Surprises was flatbread. I decided to give both tortillas and naan a try. My starting point was these two recipes - here and here . Mix together sourdough, milk and salt. Slowly add in flour mixing until the dough forms a ball and is not too sticky. Then knead the dough for 2 - 3 minutes. Transfer to a well-greased bowl, grease top of dough, cover and let sit overnight. My dough had a bit of a crust on it the next day but nothing too bad. Divide the dough into balls and heat up a cast iron or non-stick fry pan. Use olive oil to grease rolling pin and rolling surface. Roll dough balls flat and thin. Place your tortilla into pre-heated pan and cook briefly on both sides. It took less than a minute per tortilla. I turned the pan down to medium to medium low because the cast iron holds the heat and I didn't want my tortillas to burn. The recipe makes between 1 1/2 dozen to 2 dozen depending on the size. These were very good. I ate some warm and froze the rest for later. Next time I make them, I will try to make them a bit larger and rounder so I can use them for quesadillas. My starting point was here and here . 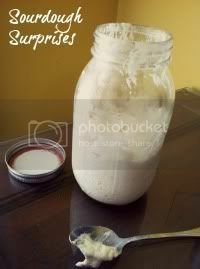 Mix sourdough, milk, and yogurt. Add dry ingredients and mix together, adding more flour if dough is too sticky. Knead a couple of minutes. Turn onto floured board and knead several times until dough is smooth. Place in a greased bowl and let rest several hours. Divide dough into 8 pieces and heat up fry pan. Again I started at medium high and then turned down the heat. Roll dough on floured board. I found the dough a bit stickier than the tortilla dough and a bit harder to manage. Cook each side until done. It smelled very nice cooking with the herbs in the dough. The naan took a little longer to cook than the tortillas because the dough was a bit thicker. I also found it harder to keep the naan round. The naan were good but my preference is the tortillas - partly because they were less trouble and partly because I have eaten more tortillas in the past than naan. Wonderful job! Both your pita and tortillas look fantastic! :) Thanks for baking with us this month! Thanks! I enjoyed it plus looking at everyone else's recipes! I love making tortillas but I've never made them with sourdough - that's what I should have done this month, because yours look great! Thanks! They were a fun and tasty challenge. Two of my favourite foods! I often eat them plain without any condiments. Never tried oregano and thyme on naan, so I must try that next time. I really liked the scent of the herbs while they were cooking. Thanks! I enjoyed making them but enjoyed eating them even more! I'm really tempted by the tortillas, they look great! Interesting tortilla recipe - I may have to try that. The only tortillas I've made used lard or oil, and so I don't make them often because they're not healthy.